One iteration of the Reciprocal Teaching Process. Respected research has shown for some time that certain teaching approaches are particularly effective at improving students’ reading skills; one such strategy is called Reciprocal Teaching (Oczkus, 2010:Palincsar and Brown, 1984) which gets learners reading in groups. I’ve written about the success of this strategy in two previous issues of NATE Magazine (June 2015/June 2016) and shown how to do it in several NATE workshops. As I’ve worked with more and more classes and teachers, I’ve realised that while many English teachers are keen to adopt the strategy and are persuaded of its value, they don’t feel confident with teaching it without an “expert” there to guide them. The central problem is that to get Reciprocal Teaching “off the ground” it needs to be “modelled” by the teacher to small groups so that students can then start “doing it for themselves”. Based as it is on the theory of Lev Vygotsky (Vygotsky and Cole, 1978), the modelling is a vital stage; there needs to be an expert modelling the approach before students can confidently begin reading in groups with chaos being unleashed! In my experience, either the English teacher doesn’t feel that confident at modelling the strategy themselves or they have big classes and feel that they can’t work intensively with small groups over a series of lessons. To get around this problem, I have begun writing some creative “teaching scripts” which do the modelling for the students. What follows is an extract of one such script, showing how Reciprocal Teaching might be done with the poem “Ozymandias”; I have imagined that a mixed ability Year 9 or 10 class might be reading the poem in the script. The script is not the “perfect” way to do the strategy; it is a “model” in the Vygotskian sense(Vygotsky and Cole, 1978), a possible approach which is open-ended and subject to criticism. If you are interested, maybe you could photocopy the script and get a suitable class reading it in groups: it is aimed at groups of six reading it, but you could ask students to read the script individually, pairs or any configuration you deem fit, doubling up roles etc. The students should read the script, and then do the vital work of reflecting upon what they have learnt about improving their reading skills once they have read the script; what strategies are being shown in the script which they use already when reading texts? What strategies do they not use? To recap quickly: Reciprocal Teaching involves students reading texts in groups, with every student at some point becoming a “teacher” who models and leads discussions which focus upon what the text is about, helps everyone clarify what the text means, predicts what might happen next or “fills in any gaps”, and gets everyone reflecting upon what they have learnt from the exercise, including what they have learnt about their learning. The following script is meant to be read by GCSE students as an introduction to Reciprocal Teaching, and is followed by a “model” of how RT might be done with the poem Ozymandias. TEACHER: I don’t like reading. QUESTIONER: Hey, aren’t you supposed to be a TEACHER? Aren’t all TEACHERs supposed to like reading? MOTIVATOR: Good point, QUESTIONER, as the MOTIVATOR in the group, I must say that telling your students that you don’t like reading is a bit demotivating! ASSESSOR: And as the ASSESSOR, I would have to grade that teaching strategy as unsatisfactory. I don’t think any school inspector would be happy to hear a TEACHER say that! LEARNING TO LEARN CHIEF: As LEARNING TO LEARN CHIEF, I think we need to give the TEACHER a break: my job, which is overseeing Learning to Learn is about helping people improve their learning by thinking about their learning and what works for them and what doesn’t. My first question is: what do we exactly mean by a TEACHER and what is expected of them? SUMMARIZER: As summariser, I would have to sum up the meaning of being a TEACHER as someone who helps other people learn. TEACHER: And it’s true, I have a problem. I mean I am actually a school student who has been asked to be a TEACHER in a group. And I don’t feel comfortable with the role at all! First of all, I don’t really read that much! QUESTIONER: Why are you not comfortable being a TEACHER? I don’t get it. MOTIVATOR: Come on, TEACHER, everyone likes you in the group so you don’t need to be frightened. ASSESSOR: And having seen you outside lessons, I have seen you read the sports’ news on your news on your phone, and doing all that Snapchat, Facebook, Twitter stuff all the time. You’re always reading! SUMMARIZER: So, to sum up, are we saying that our TEACHER is a much better reader & TEACHER than they think? LEARNING TO LEARN CHIEF: And perhaps we think reading means reading in school when reading is a lot more than that. TEACHER: Hey thanks guys, you’re cheering me up! I didn’t enjoy the thought of being a TEACHER, but I can see now that I have helped you learn a bit because we’ve all thought harder about what teaching and reading is. QUESTIONER: What is the point of making students TEACHERs anyway? I mean, we have got a real TEACHER over there, aren’t they supposed to teach us? MOTIVATOR: But I reckon I learn more when another student teaches me something: I kind of listen more carefully. I’m less scared somehow and this makes me relax and listen more carefully. ASSESSOR: And when you become the TEACHER you quickly realise what you know and don’t know because you must explain it in our own words. SUMMARIZER: So perhaps the TEACHER is the person who learns the most in the classroom because they are always trying to explain things. LEARNING TO LEARN CHIEF: This is interesting. It’s at this point, I would like to give us all a new term to learn. This term is called ‘reciprocity’ as a noun, and ‘reciprocal’ as an adjective. TEACHER: Can you all write the heading ‘Reciprocity’ in your learning journals. What do you think it means? QUESTIONER: Aren’t you supposed to tell us? Isn’t that why you’re a TEACHER? MOTIVATOR: Hey, it’s better if we look up words for ourselves and learn to learn things for ourselves. QUESTIONER: What does that mean? SUMMARIZER: Let’s try and put it into our own words. Hmmnnn. LEARNING TO LEARN CHIEF: It kind of means “you get what you give”. ASSESSOR: That’s a good summary, L2L Chief! LEARNING TO LEARN CHIEF: I like my new name, L2L Chief! TEACHER: Come on, back to the main point, reciprocity when you give something, you expect to get something of equal value back. QUESTIONER: So, if I help you with your reading, I expect you to help me when I find some passage difficult to understand. MOTIVATOR: Or if I am really positive about your abilities, then I expect you to be nice about me. ASSESSOR: Kind of. It’s more than people being nice to each other though, it is about people valuing each other, really valuing what they must say. LEARNING TO LEARN CHIEF: OK, let’s all write down in our learning journals our definitions in our own words about what reciprocity means. TEACHER: And I think we’re ready now to introduce the next idea: Reciprocal Reading. QUESTIONER: Is this when everyone helps each other with their reading? MOTIVATOR: Hey, QUESTIONER, well done! You’ve got it in one. It’s about really trying with your reading, and then expecting the other people in the group to try as well. ASSESSOR: It’s also about us all assessing our reading skills and figuring out how we might improve our reading together. The reciprocity comes in because we assess ourselves and assess each other, valuing each other’s contributions. Reciprocal teaching is a reading technique which is thought to promote students’ reading comprehension. 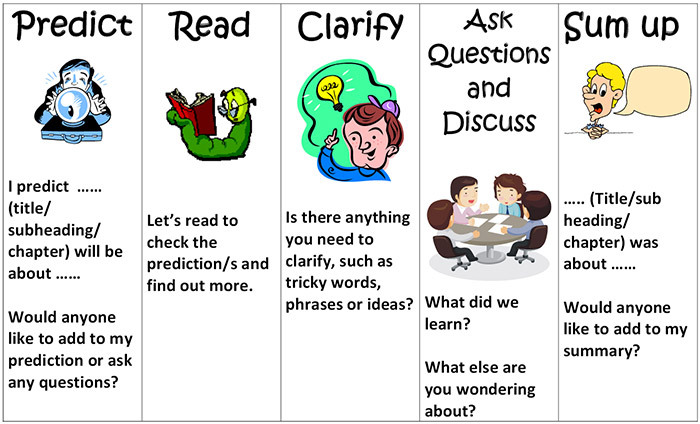 A reciprocal approach provides students with four specific reading strategies that are actively and consciously used to support comprehension: Summarising, Clarifying, Questioning, Predicting and Evaluating. QUESTIONER: what does that all mean? TEACHER: We’re going to find that our now! MOTIVATOR: We’re all going to read an exciting, brilliant poem. And we’re going to use Reciprocal Reading to read it together and question what it is about. ASSESSOR: I’m going to check our understanding of the poem as we read it; the main thing to remember first when reading is to deal with two central points: what does the poem mean, and how well are we understanding it? TEACHER: Then the cycle begins again with the next scene. At that point, the goal is that the role of the TEACHER passes on to another person so that everyone has a go at being the TEACHER. The idea is that you do the cycle a few times and then it becomes “natural” and you naturally ask the right questions that come to mind. You “internalise” how to read well by summarising your understanding of the passage, by clarifying difficult bits, by asking good questions that make you think more deeply about the text, and by predicting what might happen next. QUESTIONER: I am confused. What am I supposed to be doing? Can someone help me? MOTIVATOR: Don’t worry, we’ll have a go with the first scene and then you’ll begin to get the idea. ASSESSOR: It generally takes a few lessons before people get the hang of Reciprocal Reading – sometimes called Reciprocal Teaching. It always starts with people being confused because it can seem complicated at first, but after you’ve done it for a few goes it becomes quite natural. MOTIVATOR: It’s like learning to walk or drive; it seems difficult at first but then it becomes natural. And when you get used to it you really start to enjoy it and reading much more. It’s really fun reading in groups and you learn a lot from it! SUMMARIZER: But to sum up, it really is about people learning to read together and discuss what they are reading. LEARNING TO LEARN CHIEF: That’s a good summary, SUMMARIZER. OK, let’s all write down in our learning journals, what we think Reciprocal Reading means. TEACHER: OK, off we go, we’re going to read Ozymandias, a GCSE set text on my courses! Come on, let’s have some fun! Can I ask all of us to read the poem silently to ourselves first, and then before we do any discussion work, we are going to read this poem 3 times out aloud; MOTIVATOR, ASSESSOR, and QUESTIONER, can you read it aloud to us? QUESTIONER: What’s the point of reading it aloud without trying to work it out immediately? SUMMARIZER: We need to get familiar with the words first and get an overall sense of it. ASSESSOR: Can I also ask us to underline difficult phrases/words, and sum up what we think the poem might be about and how much we understand BEFORE we read the script about the poem? MOTIVATOR: Yes, and let’s not get depressed if we find it difficult! Difficult texts are fun! We have a chance to work out their meanings by ourselves! TEACHER: OK, what we’re going to do now is to use Reciprocal Teaching to read this difficult poem – well, I think it looks tricky! QUESTIONER: As the QUESTIONER, I would have to ask: What do you think makes it such a difficult poem for so many GCSE students, do you think? MOTIVATOR: As the group MOTIVATOR, I would guess it was partly linked to many GCSE pupils’ motivation to read it; I reckon they often look at the title and some of the words like “antique” “trunkless” “visage” etc. and think there is no way they can understand the poem, and they lose their motivation and give up. LEARNING TO LEARN CHIEF: OK guys, points taken, but how are we going to understand this poem though? SUMMARIZER: Do you think we should look up the difficult words FIRST of all? TEACHER: We could do that. That’s one strategy, which we could do because we’re not in a test, but what do you do if you’ve got no dictionary/Google? QUESTIONER: How will that help us understand better? ASSESSOR: It might give us the confidence to work out WHAT WE DOES KNOW! We need to honestly ASSESS our true knowledge because I bet with a bit HARD thinking, we can work out bits of the poem. LEARNING TO LEARN CHIEF: Yes, let’s look at the poem again and highlight what we DO know. SUMMARIZER: And make some notes around the poem. TEACHER: OK, let’s take it line by line, and work it out together. MOTIVATOR: Togetherness, man! This is about being resilient learners! Growth mindsets, not Fixed Mindsets! TEACHER: OK, team, let’s go for it! LEARNING TO LEARN CHIEF: Right, the title — what does it mean? QUESTIONER: Not a clue. Does that mean we give up, I mean if we can’t get the title, how on earth are we going to do it? I can’t even say it! SUMMARIZER: Break it down OZ –Y-MAN-DI-AS. MOTIVATOR: Well done, break it down. That’s what we do. QUESTIONER: What does antique mean? Who is this ‘I’? SUMMARIZER: Antique means ‘very old’. LEARNING TO LEARN CHIEF: So the line means ‘I met a man who travels a lot who came from a very old land’. Stand in the desert. . . . QUESTIONER: What does ‘vast’ mean? MOTIVATOR: Not sure, it makes me think of an elephant, but ‘less’ means ‘without something’, so it means without an ‘elephant trunk’. Doesn’t make sense! LEARNING TO LEARN CHIEF: That the legs don’t have a body! So the ‘trunk’ means ‘without a body’! MOTIVATOR: Well done! You’ve got it! QUESTIONER: So, can someone put this in simple language for me? MOTIVATOR: Great work! Well done! QUESTIONER: Here we go again, what does ‘visage’ mean? I need a dictionary! MOTIVATOR: But hang on, let’s look at the other lines, this thing, this ‘visage’, is ‘half-sunk’ and is near the legs of stone. LA: Great work MOTIVATOR, this is giving us a clue. LEARNING TO LEARN CHIEF: So, the sand has covered this thing. QUESTIONER: What has a ‘frown’? SUMMARIZER: Yes, ‘visage’ means ‘face’! Woah! We did it! High five! TEACHER: Hang on, there are other things too. LEARNING TO LEARN CHIEF, can you work out more? QUESTIONER: What is a ‘sneer’? MOTIVATOR: When you look really snidey, or in a nasty way, at someone. You can kind of work out the meaning from the sound of the word, which has a sneeeeeering quality to it! QUESTIONER: The face has a ‘sneer of cold command’ so this is a face which was commanding someone? ASSESSOR: Maybe the face was very unfeeling, emotionally cold? TEACHER: So what is happening here? QUESTIONER: What is a sculptor? SUMMARIZER: A person who makes statues. LEARNING TO LEARN CHIEF: So, the person who made this face ‘well those passions read’. This is difficult. Any guesses? ASSESSOR: Maybe the sculptor was really good at reading ‘passions’. ASSESSOR: Yes, that sounds about right. TEACHER: So, the sculptor was good at understanding the feelings of the person whose face lies all broken in the desert. What survives are the feelings in the face: the sneer, the wrinkled lip. QUESTIONER: What is ‘stamped on these lifeless things’? MOTIVATOR: These feelings were ‘stamped’? Did someone tread on the lifeless things? What are the ‘lifeless things’? ASSESSOR: Guess! Are the ‘lifeless things’, the stones on which the sculptor carved his face? LEARNING TO LEARN CHIEF: That makes sense. The feelings are ‘stamped’ or printed, or drawn, or carved on these dead stones. TEACHER: What have we got so far? And how much do we understand? MOTIVATOR: This is important; summarising our ideas so far so that we remember what is going on and checking in on the level of our understanding. LEARNING TO LEARN CHIEF: OK, we’ve got a guy who met someone who travels a lot who has seen a stone face in the desert which has a nasty face, and this tells the traveller that the person who made the face was good at understanding the feelings of the person he sculpted. ASSESSOR: That’s great work! Well done. And if I were to assess our level of understanding I would say that we are understanding most of the meaning of the poem, which we are working out because we are reading the lines slowly, not getting demotivated if we don’t understand something immediately, and we are re-reading, and asking questioning about what we don’t understand. LEARNING TO LEARN CHIEF: We are also working out what we don’t understand; this is important because sometimes it’s difficult to work out what you know and what you don’t know. When you know what you don’t know, you can kind of focus upon it, and then work out what it means by re-reading and asking questions about it, and make good guesses at its meaning, like we did with ‘visage’. MOTIVATOR: Guess; is it a platform or sign or something because there are words on it? QUESTIONER: Who is speaking here? SUMMARIZER: It couldn’t be the traveller, because he’s a traveller, not a king. ASSESSOR: The speaker of the poem? LEARNING TO LEARN CHIEF: He’s not a king either. MOTIVATOR: What about the actual person who is the statue? What if it was a statue of a real king who lived once? ASSESSOR: Very good, that makes sense! QUESTIONER: He thought he was the very best king of all? MOTIVATOR: I’m getting this now, and he said to ‘ye Mighty’ to look on ‘his works’ and ‘Despair’? ASSESSOR: He is speaking to ‘mighty’ people? SUMMARIZER: Who were important people, because they were ‘mighty’ or strong? QUESTIONER: What does ‘ye’ mean? ASSESSOR: Guess: an old-fashioned word for ‘you’? QUESTIONER: What are his ‘works’? Drugs? MOTIVATOR: No, not drugs I think, but all the great things he did as a king, maybe a huge palace or something. TEACHER: OK, I think we’ve got this, the king said to everyone he was the greatest king of all, and he told everyone to look at all the great things he’s done: ‘my Works’ and ‘despair’. ASSESSOR: Maybe he wants people to look at his great works and feel really bad that they will never be as great or as important as him? SUMMARIZER: Yes, a bit like a really important celebrity who says to everyone: just look at my huge mansion just so that we will all feel bad that we can never be as rich and as important as him or her? ASSESSOR: Yes, that’s it. The king had a statue made himself, a very big one, which was to show off! QUESTIONER: What does he mean ‘nothing beside remains’? LEARNING TO LEARN CHIEF: There’s nothing else, there are no great works, no great palaces, nothing. ASSESSOR: And the statue is a ‘colossal wreck’. SUMMARIZER: Colossal means very big. MOTIVATOR: And it’s a complete wreck, a total mess. TEACHER: And the sands or the desert ‘stretch far away’. LEARNING TO LEARN CHIEF: And there is nothing around the sands, the desert is ‘boundless and bare’. SUMMARIZER: ‘Boundless’ means without any boundaries I think, and bare means naked. MOTIVATOR: There is nothing around. Absolutely nothing. ASSESSOR: And the sands are also ‘lone’ and ‘level’. SUMMARIZER: Maybe ‘lone’ means ‘lonely’? MOTIVATOR: Yes, that makes sense. The statue which is all broken up is in a ‘lonely’ place. LEARNING TO LEARN CHIEF: And it’s ‘level’ or ‘flat’. So there are not even the outlines of the palaces and great things in the sand. There is nothing there. QUESTIONER: So this big, show-off king thought that everyone would look at his great works and feel bad that they weren’t as important as him, but actually, there’s nothing left of his work? MOTIVATOR: I reckon that’s it. I reckon we’ve cracked it! This poem is about a traveller who saw this broken statue and this sign which said this bloke Ozymandias was a great king, and everyone should despair that they could never be as great as him, but actually, there is nothing there. QUESTIONER: What do think the message is for this poem? QUESTIONER: How great big show-offs die and are forgotten? MOTIVATOR: That time kills you off in the end, and nothing is left of you, no matter how important you think you are? ASSESSOR: Yes, very good Lead MOTIVATOR. Now, could I ask what we learnt about reading difficult texts in doing that exercise? MOTIVATOR: That if you work together, and really think about what you do know, and make some guesses, then you can more or less work it out. We never did know what ‘pedestal’ meant, and I wasn’t sure what ‘sneer’ meant, but I basically got most of the poem from the other words. QUESTIONER: And that asking questions helps? LEARNING TO LEARN CHIEF: Breaking the poem down into small bits, and working it out that way. ASSESSOR: But also, assessing what we know about the poem so far: what we know and what we don’t know. MOTIVATOR: And not being frightened if we don’t know something, but seeing it a great challenge! Being motivated to work it out like a really interesting puzzle. QUESTIONER: But what if you guys are not here to help me? TEACHER: Well this is the great thing, we can remember how we did it as a group, and then carry these different roles in our heads when we read a poem by ourselves, so we are a TEACHER to ourselves, explaining things clearly and not panicking. QUESTIONER: And we have a Lead QUESTIONER in our brains, asking questions that help us focus upon what is important. ASSESSOR: And we have a Lead ASSESSOR in our head checking what we know and don’t know. SUMMARIZER: And we have a SUMMARIZER in our heads summarising things in clear English. LEARNING TO LEARN CHIEF: And we have a LEARNING TO LEARN CHIEF in our heads, working out how we know and don’t know, figuring out strategies to help us learn better, doing things like noting things down and working out difficult words. TEACHER: Very good guys. Together we are like a gigantic brain. A community of learners which we can carry in our heads forever and forever. SUMMARIZER: OK, before we get too carried away, can you now write a summary of the poem in your Learning Journals, or if you prefer what you learnt about reading difficult poems from our Reciprocal Teaching? TEACHER: The next step would be to then perhaps do some analysis of how the writer achieved his effects, but you can’t do that until you’ve understood the poem properly. QUESTIONER: Why not? I’m used to just analysing the alliteration and onomatopoeia, and never really worry that much about understanding poetry. I used the DAFOREST acroynym. I always do well in my tests because it looks like I am really clever, knowing all this terminology. LEARNING TO LEARN CHIEF: But you won’t be able to write very well at the very top level about those things if you don’t understand what the lines mean. QUESTIONER: That’s true. I never get the top grades, but I do generally pass, but the real teacher always writes, “Discuss the effects of the techniques you have spotted” or says I am “feature-spotting”. Whatever that means. TEACHER: That means you are just finding certain techniques and now relating those techniques to what the poem means. QUESTIONER: That’s because I don’t usually know that well what the poem means! TEACHER: Exactly, so that’s why you need to work out what it means first, and then find the techniques! QUESTIONER: OK, I think I get it! ASSESSOR: I have to say, analysing poetry can kill the enjoyment. Maybe it would be better to write our own poems about show-offs? MOTIVATOR: Yes, let’s write a poem called ‘The Ruined Mansion’ about a huge mansion of a celebrity who has died and how it has all these signs that big him up, but now the wind and the rain has got into his king-size bedroom, his sports car has rusted to bits and his bathroom has the ceiling fallen in. ASSESSOR: Yes, and you could show you understanding of Ozymandias by writing a modern update of it, where you met someone from Hollywood who told about this house. SUMMARIZER: Yes, I could write a poem about Michael Jackson’s ‘Neverland’ and how it was all abandoned and shut up, and how this famous guy is now dead. SUMMARIZER: Oh yeah, but he will be in a hundred years’ time, probably. TEACHER: OK, everyone, can you either write an analysis of ‘Ozymandias’, discussing the effects of the poetry, or write your own poem possibly called ‘The Show-Off’. MOTIVATOR: Well done guys! We did it! We understood a difficult poem! Now have a go at annotating this script so that you highlight the reading strategies that were used to get the group understanding the poem. Then answer this question: what reading strategies could you use to help you improve your reading? Re-read the poem in a group WITHOUT this script, and have a similar discussion to the one above which uses Reciprocal Teaching to help you understand the poem even better, exploring this time the language techniques in the poem. You could use the DAFOREST acronym to help you annotate the language features of the poem. Have a think about how you might use this script in the classroom; the key thing to bear in mind is that it is only a model; not the perfect way. Students and you should reflect critically upon it and use it as a way of getting groups to discuss poetry and texts meaningfully. Brown, A.L., Palincsar, A.S., 1987. Reciprocal teaching of comprehension strategies: A natural history of one program for enhancing learning, in: Day, J.D., Borkowski, J.G. (Eds. ), Intelligence and Exceptionality: New Directions for Theory, Assessment, and Instructional Practices. Ablex Publishing, Westport, CT, US, pp. 81–132. Gaskins, I.W., 1998. There’s more to teaching at-risk and delayed readers than good reading instruction. Read. Teach. Newark 51, 534–547. Palincsar, A.S., Brown, A.L., 1984. Reciprocal Teaching of Comprehension-Fostering and Comprehension-Monitoring Activities. Cogn. Instr. 1, 117–175. Petty, G., 2009. Evidence-Based Teaching A Practical Approach Second Edition, 2nd Revised edition edition. ed. Nelson Thornes, Oxford. Street, B.V., 2011. Literacy inequalities in theory and practice: The power to name and define. Int. J. Educ. Dev., Literacy Inequalities and Social Justice 31, 580–586. Let’s support the summer reading challenge and get every child reading!